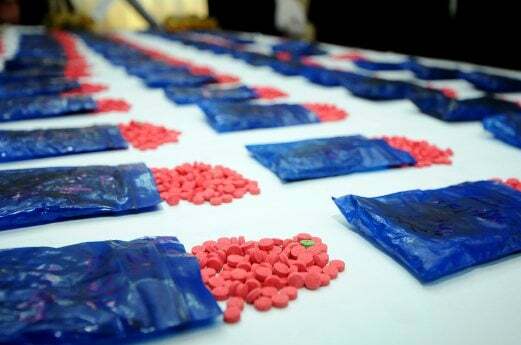 In a shocking raid, Burmese authorities discovered 4 million methamphetamine pills in possession of a Buddhist cleric, who kept the illegal merchandise hidden in his monastery. Burma is a country where drug smuggling is rampant – it is the second largest opium producer in the world and a leading source of crystal meth in Southeast Asia. Methamphetamine is typically produced in the north-eastern part of the nation, before being shipped over the border to be resold in the destination countries in the region. Despite intense efforts to bring the problem under control, drug trafficking is a fact of life in this developing nation. However, arrest of a Buddhist monk for large scale meth dealing was a big surprise, even for local standards. This happened recently in the state of Rakhine, which is located near the boundary with Bangladesh and is therefore an attractive area for activities of this kind. The monk was caught when the authorities intercepted him on the road, acting on a tip they received beforehand. In the car, there were 400,000 pills containing methamphetamine – a huge amount worth millions in the black market. Both the driver and his clandestine cargo were immediately taken into custody by the anti-drug task force. Further investigation unearthed another 4.2 million meth pills, carefully stashed in the place of worship where the accused monk lived and practiced. To make things worse, police found a couple of grenades and some ammunition in the monastery as well, which is totally incompatible with Buddhist principles of non-violence. It wasn’t immediately clear where the pills came from or whether the monk was acting as a part of a larger organized network. While the investigation is ongoing, no other monks were accused of wrongdoing and the perpetrator is treated like a single ‘bad apple’. Expectedly, the case caused national outrage and quite a bit of embarrassment for the religious community in Burma. The accused priest is likely to lose his status and go to trial as a regular citizen, as the religious authorities are trying to distance themselves from the incident. He is looking at a harsh sentence if convicted, since Burma is notorious for draconic penalties it often imposes on drug offenders caught with much smaller quantities of drugs. However, such policies were ineffective in stopping meth manufacturing and trafficking in the past and this high-profile case won’t do much to deter other from pursuing the same kind of trade in the future.